A punishing thunderstorm pulverized areas of southern Manitoba on Thursday night, with heavy rain, baseball-sized hail and screaming winds wreaking havoc on cars, homes and trees. 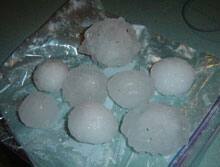 A major cleanup effort is underway in Dauphin, where giant hailstones fell for half an hour. In addition to the hail, about 56 millimetres of rain fell in about an hour, while winds gusted to 98 kilometres an hour. 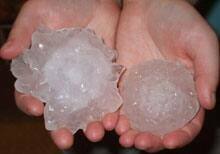 Hailstones were measuring as large as 10 centimetres in diameter (over 4 inches).